F-Secure Internet Security 2013 is a fast and easy-to-use software which is designed to protect your computer against viruses, spyware, malware, spam e-mail, cyber criminals, phishing attacks, identity theft, harmful Web sites and etc – all without compromising your PC performance, offering ultimate protection to ensure your peace of mind while surfing the Internet. F-Secure’s previous Internet Security versions have been rewarded by highly recognized industry leading analysts such as AV-TEST and AV-Comparatives and with the new 2013 version F-Secure is continuing on that path of over 20 years of providing the very best Internet protection to customers worldwide. 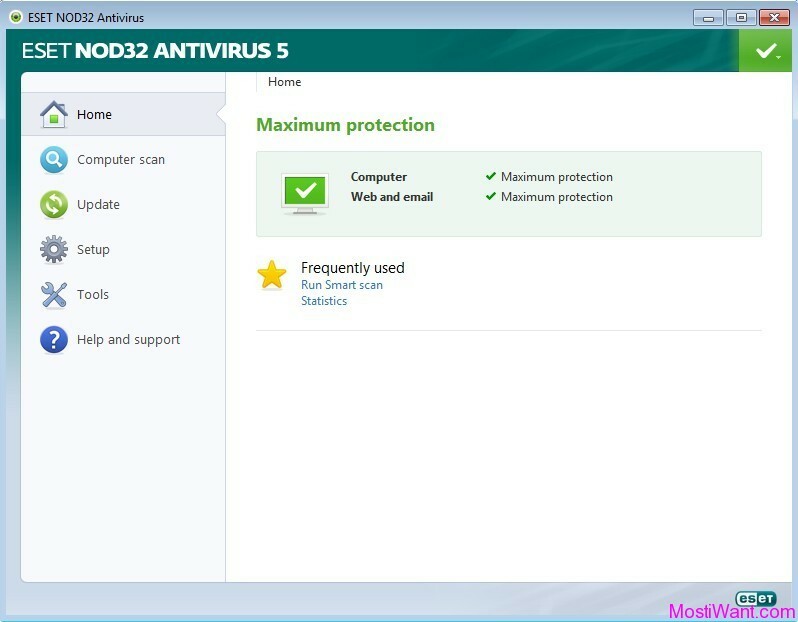 F-Secure Internet Security 2013 protects the content on your computer and safeguards you when you are browsing the web. Computer security is protection against viruses, spyware, hacker attacks and identity theft. Online safety is protection against harmful websites, getting fooled during any activities online or protecting your children against unwanted websites or uncontrolled online life. F-Secure Internet Security 2013 is priced at € 59,99 for one year serial number / subscription key on up to 3 PCs. Before purchasing, interested users can download the trial version to test the software to see if it is worth buying. Like other security software, the official F-Secure website usually provides free trial for one month only. Another way to get the serial subscription key, legally, is by looking for a promotion. 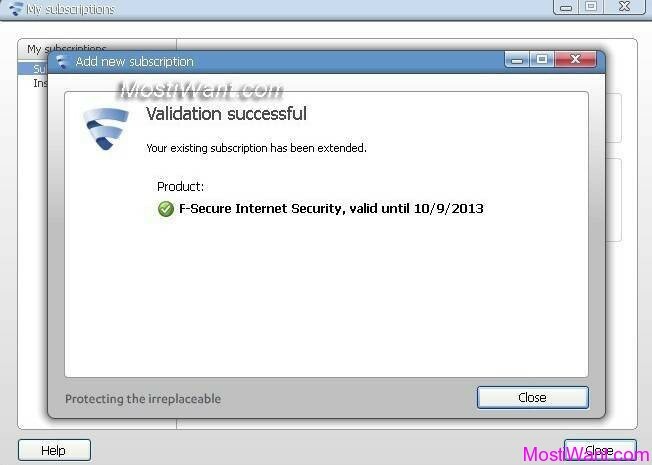 I have already shared six months license promotion of F-Secure Internet Security 2013. And now here is a trick to get F-Secure Internet Security 2013 genuine subscription key for at least one year (via adding license over license). If you like, you can have it even more than 5 years – it is all up to you. This trick has three parts: Before Hands, Get Free and Registration. The procedure is a little lengthy but it’s worth doing for an excellent security product and it will save some money for you. 1. One IP / One email can get only one license at maximum. 2. 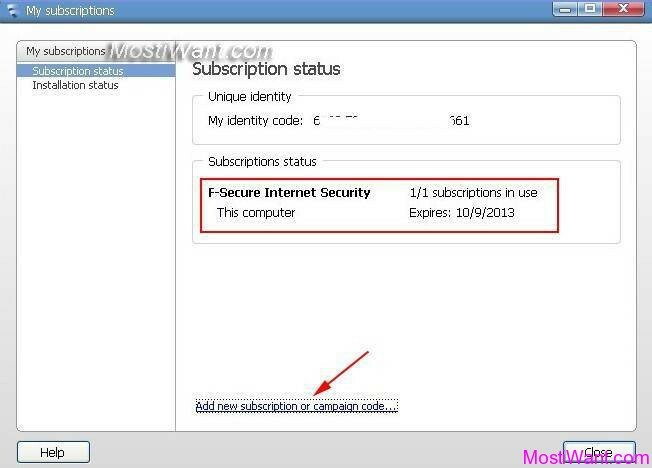 If you need one year or lengthier subscription of F-Secure Internet Security 2013, you will need to use more than one email address. 3. License request is being monitored through IP address tracking. This means one IP can get only one license at maximum. 4. As there is IP restriction, you may need to use different proxy services. Google can help you in this matter. Or if you want, you can use HotSpotShield which is free and reliable solution (You will need to disconnect and connect HotSpotShield to obtain a new IP for each license request). Note: It is important to clear your browser’s cookies and use different IP and email address for each request. 1. 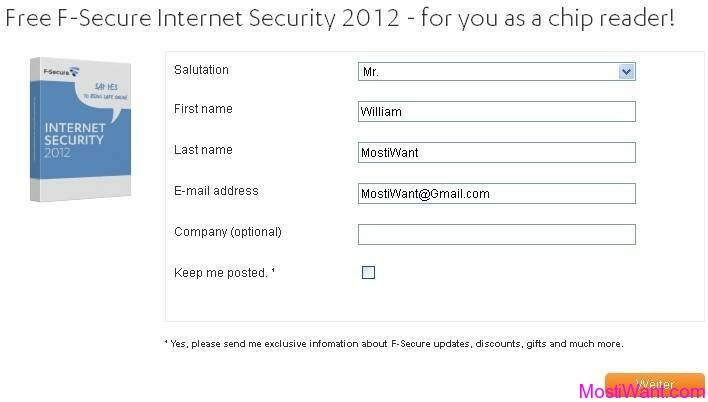 First visit the F-Secure Internet Security 2012 promotion page given below. Fill all requested fields and then click on the “Weiter” button. The page is in German, Google Translate may be help to you. After license request, if you see webpage text like this, you will get your subscription key very soon. Any other text means license or IP address has already been used. 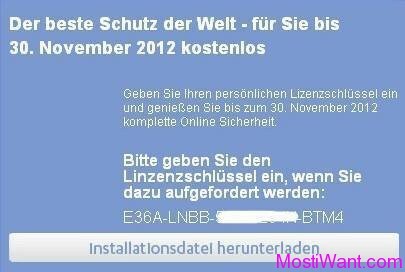 I think, the date 30 November 2012 in email means the end of promo life or the license shelf life. I advise to activate all the keys asap and if possible, do it now. 3. The Subscription License Key you received is valid for 3 Months only. So if you need one year (4*3 Months) or lengthier subscription of F-Secure Internet Security 2013, first clear your browser’s cookies and then repeat step 1- step 3 with another new IP and email address. You can repeat that exercise for as many times as you want but you need to use new email and IP address each and every time. 1. 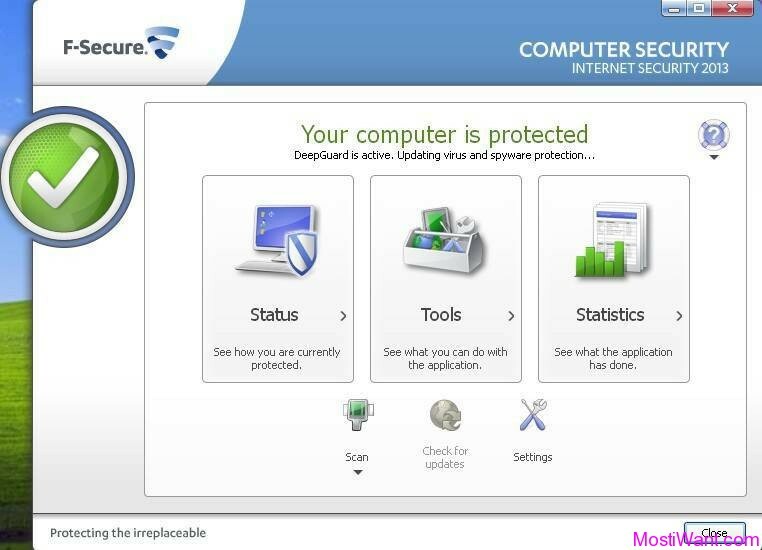 Download F-Secure Internet Security 2013 from this link (online installer) and install it. 2. 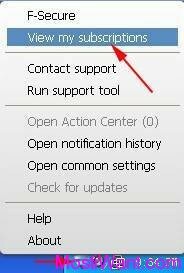 Right click on F-Secure icon in task-bar. A new menu will open. Now click on View my subscription. 3. A new windows will open. Click on blue text Add new subscription or campaign code. 4. Another new window will open. Copy and paste one of your keys in the text box labeled as My subscription key is:. Press button Validate and let it connect to internet to validate your license. 5. After validation, you can also see your license life in Subscription window. You can repeat this license validation process for as many times as you want but each and every time you need to use the new license subscription key. 6. At last, keep the last activated key safe. It is because, all other key lives will be merged to last key. @M.JAM, Sorry but this giveaway has expired now and we will have to wait the next offer in December. Please send me f secure code please………. I got 4 licenses following the instruction given, one license per ip and per one email. Four different ips and four different emails in total. Or will it say error or will it continue with activation successful. If any virus/malware attack crashes the system, the only way is to format. That is the reason i asked in the above comment. @Xi, I have not tested this, but it should continue with activation successful. Can we reuse the keys(activated) after Formatting the OS/HDD? Nice piece of software and i had the key with in 30 minutes. Same error for me. Its showing missing in key field. Yesterday I was facing the same problem, but today is working. Yes its working now, and you can get many keys with the same email id.